We welcome all seniors in our community to come and add to this lively space with their energy. Seniors can enjoy a wide range of activities from reading the papers, learning new skills, to cooking and exercising with their peers. Every day, Frog Hollow offers something for our seniors to be social, healthy and engaged. We also promote intergenerational activities and welcome all generations to participate. Please come visit us and learn about the variety of special events and ongoing programs! We are bringing the neighhbourhood house to you! 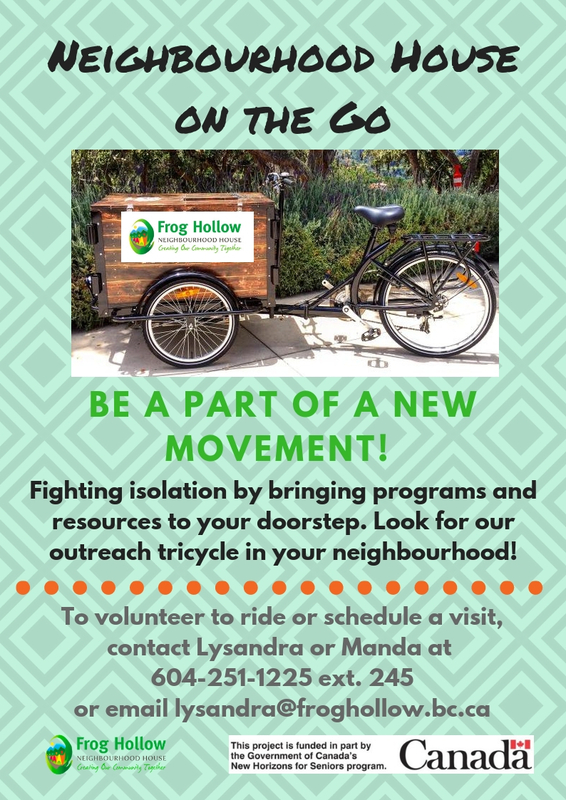 With our outreach tricycle, our outreach tricycle will bring resources, fun activities, and refreshments to older adults in the community looking for a friendly visit. To schedule a visit or volunteer, please contact Gloria. Are you an older adult who wishes to pursue a healthier and more active lifestyle? 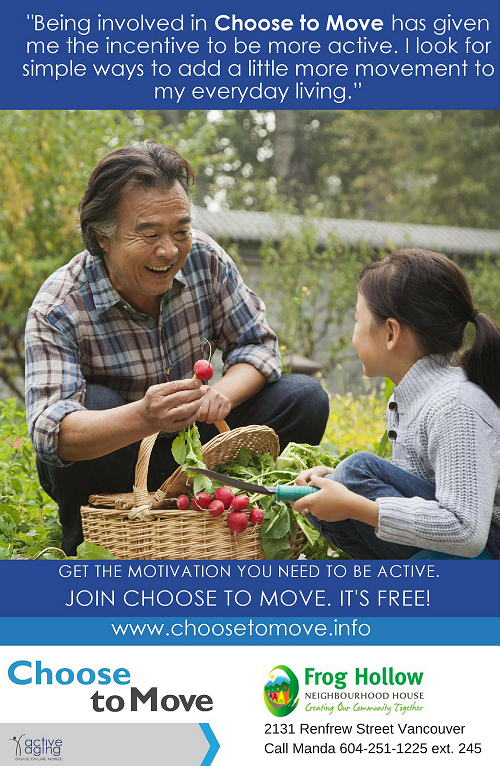 Join our free Choose to Move program to work with an activity coach! We will help you implement daily habits to get you moving, at a pace comfortable for you. Contact Manda at 604-251-1225 ext. 245 for more information. Come to learn Tai Chi 108 moves taught by instructors Wilkie and Kim. There will be 15 sessions. Registration required. Please contact manda at manda@froghollow.bc.ca or 604-251-1225 ext. 245. Tai Chi is a fluid and soothing form of exercise that is easy on the joints and great for improved health. Drop-ins are welcome. Join us Monday mornings for computer class with mentors of Monica, May, and Linda. For beginners. Feel free to bring your questions and the mentors will do their best to assist you. Come dance with us! This class is completely senior-led and is similar to a form of line dancing. All levels welcome. For more information, please contact Manda at 604-251-1225 or at manda@froghollow.bc.ca. From tea and conversation, bingo, arts and crafts and line dancing, this active group of Cantonese and Mandarin speaking seniors meets every Monday. Eating lunch and playing bingo is a great way to spend an afternoon. This group of Cantonese and Mandarin speaking seniors meet most Tuesdays. Please call ahead to confirm. Come and knit with friends at George Whiten Place (right next to Frog Hollow) in the Common room/laundry room. Please bring your own materials and your projects along to this friendly and supportive group. For those who do not have their own materials, we can provide yarn and needles. Knitting group members will be happy to share tips! For more information, please contact Manda at 604-251-1225 or at manda@froghollow.bc.ca. Join our group to enjoy Mah Jong and play other fun games! A great opportunity to meet new people and have a great time. Join us for a slow walk around the neighbourhood where you can meet new friends and enjoy exploring the community. Meet at Frog Hollow Neighbourhood House at 10am and return to Frog Hollow around 11:30am and stay for a coffee. For more information and registration please call Manda at 604-251-1225 or email at manda@froghollow.bc.ca. Caregiver support for caregivers of older adults at home or at a care centre. Join us for a free dinner, resource exchange, and social time with other caregivers. Join us Thursday mornings for a casual conversation with other older adults. Various games and activities will be available along with free coffee, tea and light snacks. If you need assistance arranging transportation to our program, please let Lysandra know at 604-251-1225. Tea time and arts and crafts bring this group together each week. Occasional outings happen throughout the year. Come and sing with friends on Friday afternoon. This club is senior-led. 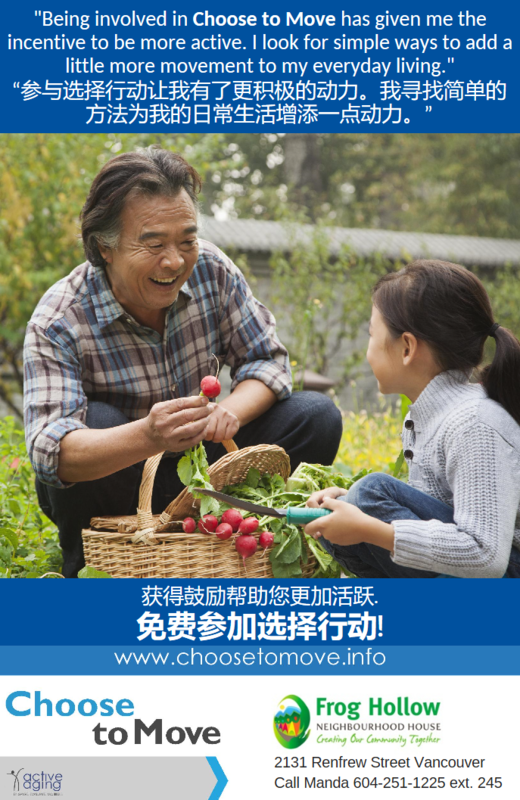 Drop-in to sing English and Chinese songs or bring your own karaoke CD in any language. For more information, please contact Manda at 604-251-1225 or at manda@froghollow.bc.ca. Senior community members get together monthly to share interests, participate in classes, and discuss future programming.